On a day where we ‘re already talking about suring up our iPhone passwords, it seems fitting to also mention an impressive new security application available to jailbreak users. Firewall IP is a relatively new app “ available in the Cydia store for $1.99 “ that provides just what you ‘d expect given its name, i.e. a firewall monitoring outbound connections on the iPhone. I ‘ve been testing the app out a bit and I like it. It does just what it says on the box, and quite effectively. It even does its job relatively unobtrusively “ or at least as much as any firewall can do in that respect. Firewall IP allows you to block outgoing connections (TCP and UDP). 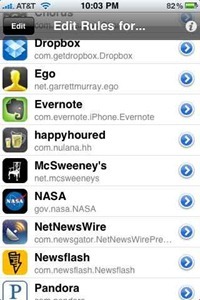 It hooks into applications from App Store and Cydia. Firewall IP will warn you if the app wants to establish a connection to a host and shows you the hostname. 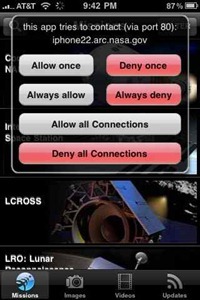 Then you have the options to allow/deny all connections for the application. You can decide if the application will send data. Developers will no longer be able to collect stats about you (UDID, phone number, usage statistics) or even collect personal data. I ‘m not so sure how far I agree with that last sentence “ as you may well find that if you refuse an app ‘s connection attempts to an analytics provider (or other required connection) that it ‘breaks ‘ the app and forces you to choose to live with where it connects to or not use it. Having said that, this is an extremely useful app no matter which way you slice it. When you first install Firewall IP, here ‘s how you set it up: do nothing. Just start firing up your apps that you know connect to the web (which may be nearly all of them as so many games use global scoreboards and such) “ and Firewall IP will launch itself and give you a dialog across roughly the top third of the screen with your choices on what to do about an outbound connection an app is trying to make. As you can see above, once Firewall IP ‘s alert screen comes up, you have a full set of choices just as you do when setting firewall rules for applications on a basic desktop firewall. 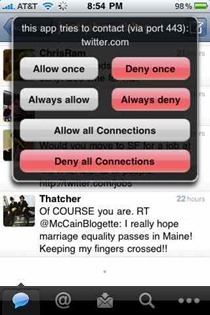 You can choose to allow or deny connections on a one-time basis, or to always allow or deny. 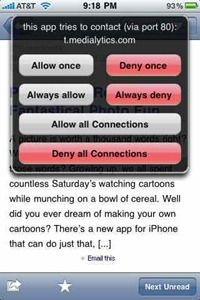 Or you can even choose to always allow or deny all connections for this particular app. As I said near the top, Firewall IP does its job about as unobtrusively as any firewall app can. Once it knows about an app, and ALL of its outbound connections, it will be quiet and leave you alone whenever you ‘re working with that app. New app, and new connections within known apps, will continue to generate alerts “ so the length of ‘settling in ‘ time for Firewall IP will vary according to how many apps you have. 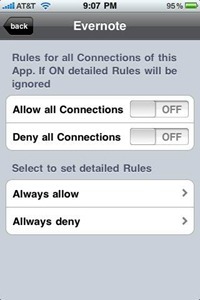 Oh, and the app has an On/Off toggle in SBSettings “ so it is super easy to manage it. My thought is that now that it has looked at most of my apps I ‘ll keep it shut down generally, and fire it up only when I have just added apps. I ‘ve had almost no issues with Firewall IP. The only one I saw with just a couple of apps was that it would slow down an app ‘s launch significantly, or even hang it up, while trying to suss out its connections. This happened with Sportacular for example “ but it resolved itself and eventually brought up the alert dialog after a couple of attempts. I did not notice any major battery or resource strain when running Firewall IP, and it never showed up in Kirikae of Free Memory as a running process “ but I ‘ve only been testing it for a short while so far. This is a definite keeper app for me “ as I think it ‘s both useful and fascinating to see where apps want to connect out to. I can ‘t imagine too many people will want to run it continuously, but with the ability to toggle it on/off via SBSettings it ‘s a winner for me. You can find Firewall IP in the Cydia store now, for $1.99. *** This app was independently purchased by the post author in the iPhone App Store. For further information regarding our site’s review policies, please see the "About" page. Hi Patrick. I noticed that you mentioned this firewall app in your road trip article recently. Just wondering if you have any more comments about it before I go and download it. Thanks…. I like the app and it has been good and caused me no issues thus far. My bad – I thought your previous comment was on another post – sorry. Hi all, why this firewall dont block incoming traffic ?